I like it,why can't you put a 250cc motor in it? how fast will it go, and what is the crusing speed? You might also want to become a California Scooter Company fan on Facebook; we always have a lot of photos going up on there. Thanks for your kind words and your interest in our bikes. This is really cute. 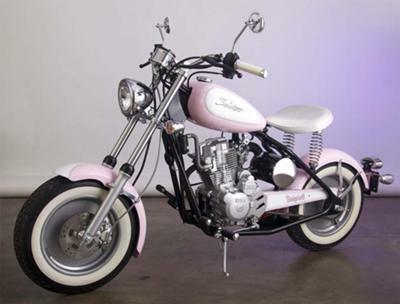 Not much for pink, but it looks like a good scoot around town bike, not sure about long rides.